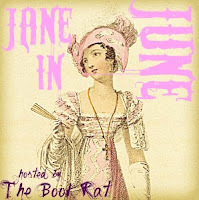 Here's my response to chapters 1-17 of Pride and Prejudice for the Jane in June Read Along. You can link up your responses to round 1, and grab the questions for round 2 here. I love how you say Wickham reminds you of Frank Churchill. He always reminded me of John Willoughby! I agree with all of your points about his description of his interation with Darcy. You know there has to be some truth there but you don't quite believe everything he says. Thanks for the discussion! I love how P&P is your comfort book! This is only my second time reading it, and though I still love Persuasion more, I'm falling in love with the characters all over again!